Can we display dimension values in italic in DeepSee Analyzer? For example, in below screenshot, Doctor names should be displayed as Italic. 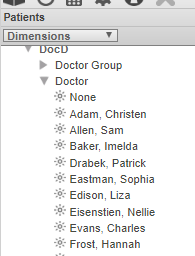 I tried including the above $C characters in architecture of the dimension property, but it is not working. Hi Sean ,I tried theGetValues() method but it return as null. Hi Scott, thanks for the reply. Yes i am using windows to connect to LDAP. I am using the Binds method. i have enabled the Delegated authentication option in LDAP options and disabled the TLS option. "0 p'LDAP Binds Error: Invalid Credentials< SAMPLES0'e^zAuthenticate+30^User.NewClass1.1^1e^^^0"
I have tested the LDAP connection using the d ^SECURITY method and it came ok.
Hi,when we will get the Authentication Method Not Supported how to recover it. Thanks Carlos So I need to check with Related server. Yes Murray I have followed the Cache Documentation.